Geriforte is anti-stress herbal formulation, with anti-oxidant and rejuvenating effect. Geriforte is a herb supplement having antistress, adaptogenic properties. It helps cells to regenerate and enhances processes of reparation. The product decreases amount of free radicals and enhances body immunity due to its immunomodulatory activity. Consult your health care advisor to determine the dosage that best suits your condition. Do not take this herbal product without recommendations of your health care advisor. Contraindications have not yet been identified. Take the missed dose as soon as possible. Do not take extra or doubled dose of this herbal product. This product is safe for health and has no known side effects. Store at room temperature between 59-77 F (15-25 C) away from light and moisture, kids and pets. If you suspect overdose contact your health care advisor as soon as possible. Geriforte is known to regulate fat and carbohydrate metabolism, improve digestion, assimilation and appetite. Its general effects consist in rejuvenation of the entire body system and retardation of the skin changes due to aging. 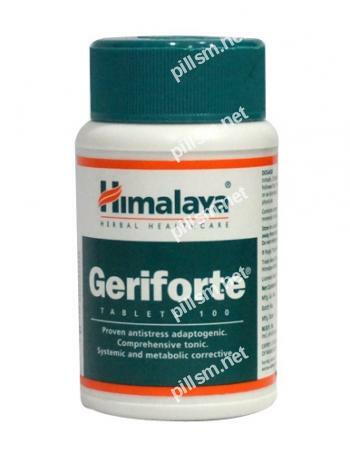 The composition of Geriforte formula consists of about forty different herbs, in particular of Chyavanprash concentrate, Shilajeet (Purified), Kumkuma (Crocus sativus), Himsra (Capparis spinosa), Kasani (Cichorium intybus), Daruharidra (Berberis aristata), Vasaka (Adhatoda vasica Syn. A.zeylanica), Kakamachi (Solanum nigrum), Arjuna (Terminalia arjuna), Ashvagandha (Withania somnifera), Guduchi (Tinospora cordifolia), Draksha (Vitis vinifera), Punarnava (Boerhaavia diffusa), Kharjura (Phoenix dactylifera), and many others. All products presented at this site are not intended to diagnose, treat, cure, or prevent any disease. Don't hesitate to consult your health care practitioner before taking any herbal supplement.